A new altar for the Cathedra of Saint Peter? A new altar, with a traditional format, has been photographed in the place of the anvil-like iron structure which had been used as an altar under the Cathedra of Saint Peter, in Saint Peter's Basilica, since the time of the destruction of the Traditional altar (cf. our post "Liturgical Renewal at Saint Peter's: How does an altar disappear?"). The new altar is still a freestanding structure, but it is an improvement. However, when will the Traditional altar be put back in its place? Its destruction remains one of the most symbolic acts of the entire "liturgical renewal" and is a stain in the record of the Wojtyla pontificate. Update: great pictures of the new freestanding altar, by J.P.Sonnen. Pictures of the Solemn Mass, of the public recitation of the Holy Rosary, and of the Adoration of the Most Holy Sacrament, as the Sanctuary of Lourdes once again opens its doors and buildings to the Priestly Fraternity of Saint Pius X (FSSPX / SSPX) during the weekend of Christ the King. The four bishops of the SSPX, who were consecrated by Archbishop Marcel Lefebvre in 1988, were present in the pilgrimage. Regarding developments in the ongoing conversation between the leadership of the Fraternity and Cardinal Castrillón Hoyos, President of the Pontifical Commission "Ecclesia Dei", the SSPX will start this Saturday a "Crusade of the Rosary" to "obtain from Our Lady the removal of the Decree of Excommunication", a "crusade" which will last from November 1 to Christmas Day. This is a most auspicious development, considering that the last time a Crusade of the Rosary was proposed by the SSPX (in July 2006), its main intention was to "obtain from Heaven for Pope Benedict XVI the strength required to completely free up the Mass of all time, called the Tridentine Mass". All eyes to Heaven, and to Rome, in the next few months. Recess continues for a few days. Other relevant news may be posted at any moment. New age for episcopal resignation? Our friends at Spanish-language blog La Buhardilla de Jerónimo notice the increasing buzz in the Italian press (including La Repubblica - external reference) regarding an imminent measure by Pope Benedict XVI, which could be released before the end of the year, and which would alter the pertinent canons and extend by three years (to 78) the age in which bishops would be required to present their resignations to the Pope. The measure would apparently not apply to prelates in Vatican dicasteries. The great Vatican controversy in the last few days of the Synod of Bishops on Holy Scripture is linked to a text written months ago for an introduction to a new edition of the Pope's book "Jesus of Nazareth". The matter is linked, though, to the deepest discussions in the Synod. A banal "adjective" is agitating the secret Vatican offices. It is an adjective used by the lord of the manor (the Pope) and by his, let us say thus, "minister for Culture", Gianfranco Ravasi. The little word of contention is: "reale" [real]. You might ask: but is it possible that five little words (r-e-a-l-e) are capable of putting the Church in turmoil? Yes, in the sense that ths adjective was used with opposite meanings by Benedict XVI and by the president of the Pontifical Council for Culture. And if it is taken into consideration that this "real" is linked to a certain gentleman called Jesus Christ, you will understand well how the controversy may grow in tone. The reason for the contention is the [new] illustrated edition of the book of Benedict XVI on Jesus of Nazareth, released in the past few days. The Pope wrote: "I have made the effort to present the Jesus of the Gospels and a real Jesus, as the historical Jesus in the true and proper sense." And also: "I consider that this Jesus, the one of the Gospels, is a historically sensible and convincing figure." Ravasi signed the introduction to this volume, and, in a certain point, mentioned Benedict's words. This way: "It is to be noted that this adjective 'real' is not automatically synonymous with historical, because we know well that so many events are not recorded, or historically documentable and verifiable, yet nevertheless are deeply real." In short: to the Pope, "real" is synonymous with "historical", for his minister for culture, it is not. Naturally, all proper justifications will be made, in an effort to deny the obvious contradiction and to please the reigning Pontiff. But this is not surprising coming from Ravasi. 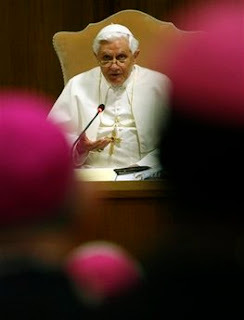 Transcript and tip: Papa Ratzinger Blog. For the Apostle, the Resurrection is not an event which stands by itself, separated from death: the Risen one is always the one who was, first, crucified. Even Risen, he bears his wounds: the Passion is present in Him, and it may be said with Pascal that He is suffering even unto the end of the world, even though he is the Risen one, and lives with us, and for us. Paul had understood this identity of the Risen one with the Crucified Christ in the encounter on the Road to Damascus: in that moment, it was clearly revealed to him that the Crucified is the Risen one, and that the Risen one is the Crucified, who asks Paul, “Why do you persecute me?” (Acts ix, 4). Paul is persecuting Christ in the Church, and now understands that the Cross is a “curse from God” (Deuteronomy xxi, 23), but a sacrifice for our Redemption. For the closing of their annual Forty Hours Devotion, the people of St. John Cantius parish in Chicago were graced with the presence of Her Imperial and Royal Highness, Maria Anna, Princess of Galitzine, granddaughter of Blessed Karl of Austria, and her husband Prince Piotr D. Galitzine along with members of the Royal Family. The Royal Family was in assistance at the 12:30 Solemn High Mass which was celebrated by parish pastor Rev. C. Frank Phillips C.R. The Mass was that of the feast of St. John Cantius (October 20). Franz Schubert’s Mass in G was sung by the Resurrection Choir and Orchestra and propers were chanted by the Schola Cantorum of St. Gregory the Great. 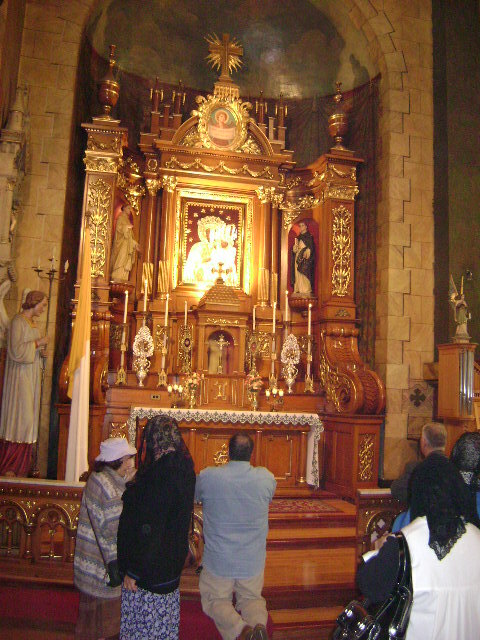 Relics of St. John Cantius and of Blessed Karl were exposed for public veneration on the church’s Lady Altar. Vespers at 4:00 were the First Vespers of the Solemnity of St. John Cantius, Confessor and included a procession. Mozart's Vesperae de Confessore was sung by the Sine Nomine Choir and Orchestra. The great care with which the traditional liturgy and sacred music were treated is a hallmark of the priests and people St. John Cantius and was a befitting tribute to their Royal visitors who came to pay homage to their beatified predecessor whose feast day is October 21. 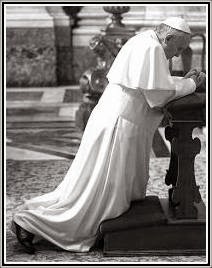 Mass Could End With More Than "Go in Peace"
The Instruction on the Motu Proprio Summorum Pontificum of 7 July 2007 which liberalized Holy Mass according to the ancient Roman rite, has been ready for some time already and is now being examined by Pope Benedict XVI. This Pontifex has learned from authoritative sources. 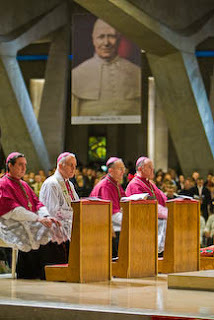 The text, signed by Cardinal Darío Castrillón Hoyos, President of the Pontifical Commission Ecclesia Dei, will be signed most likely by the Pope in late December and published in the first days of January 2009. In its most important parts the document, which had become indispensable after the many problems in the application of the Motu Proprio and forms of outright recalcitrance on the part of not a few bishops (incidentally appropriately denounced in September by the Vice President of the Commission Ecclesia Dei, Monsignor Camille Perl), addresses two crucial topics: the interpretation of the term "stable group of faithful" within an ordinary parish and the problem of personal parishes. It was even considered to list and to indicate a minimum number of faithful, but this solution has been discarded. According to the document, the traditionalist faithful present in a parish will have the full protection of the law to ask for the old Mass, and if the bishop refuses (here is the news), saying that there are no priests capable of celebrating according to the ancient rite in that place, the Commission Ecclesia Dei will authoritatively ("di imperio") send a priest able to do so to that diocese. In short, the bishops will no longer be able to refuse a priori to have the old Mass celebrated, because in such cases, the Commission Ecclesia Dei will send a delegated priest of its own. The document then analyzes the case of personal parishes in which the traditionalists want to celebrate the Christmas Mass or the Easter Triduum according to the ancient rite, also in cases of an absence of priests, or a prohibition by the bishop. The possibility of a shortage of priests could be envisaged, and also in this case, Ecclesia Dei will take care. The Holy See, therefore, wants to establish definitive clarity regarding the application of the Motu Proprio, and for this reason also the powers and prerogatives of the Pontifical Commission Ecclesia Dei will be better defined and strengthened. We also recall that several rumors indicated that this instruction should have been published in January 2008(!) - so take all rumors with a grain of salt. The only certainties are that the document exists, and that it awaits the final signature of the Holy Father. Two great names come together to present to a wider audience the Benedictine liturgical reform. Father Nicola Bux is the author of La Riforma di Benedetto XVI - La Liturgia tra Innovazione e Tradizione (The Reform of Benedict XVI - Liturgy between Innovation and Tradition) - the book is published by Piemme, and the preface is written by the most famous religious journalist in the world, Vittorio Messori. 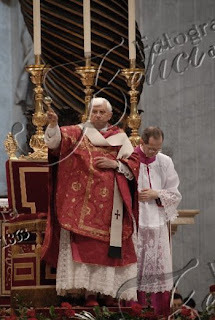 When, in July 2007, the motu proprio of Benedict XVI restored the celebration of the Latin Mass, loud voices of protest rose from several places. The widespread fear was - and is - that Pope Ratzinger had at last thrown away his mask, revealing that reactionary defender of Tradition that many accused him of being since the days in which he was Prefect of the Congregation for the Doctrine of the Faith, that is, the former Holy Office. Benedict XVI replied by showing how the recovery of the Latin Rite was not a "step backwards", a return to days prior to the Second Vatican Council, but rather forward-looking, retaining from past Tradition all that it may offer of what is most beautiful and significant to the current life of the Church. What Pope Ratzinger wishes to do in his patient work of reform is to renew the life of the Christian faithful - the gestures, the words, the time of everyday- restoring to the liturgy a wise balance between innovation and Tradition. Thus arises the image of Church always on her path, capable of reflecting upon itself and to value the riches of which its millennial treasury is full. Readers send us the following notes. Masses for the quarter are now confirmed ... . 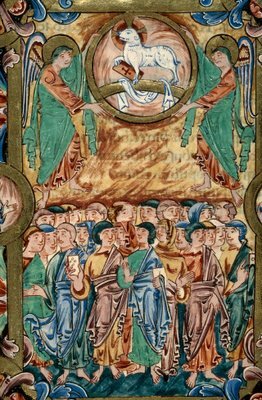 Please note the celebration of All Saints on Sat 1st November and All Souls (Sung) on Mon 3rd, both at 12.15 in the Oxford Oratory. Sat 25th October, the LMS Pilgrimage to Oxford: Solemn High Mass at 11 in Blackfriars, Procession at 2pm with the unveiling of a plaque, and Benediction at 3.30 back in Blackfriars. All in honour of the four beatified martyrs of 1589. Bishop Kenny, an auxiliary of the Archdiocese, will preach at the Mass and unveil the plaque. Please support this important event. Mon 17th Nov: Sung Requiem for 450th Anniversary of Cardinal Pole, 7pm in Magdalen College chapel, followed by a drinks reception. Fri 5th December: Solemn High Mass in St Birinus, Dorchester, for the patronal feast of this church, at 7pm. As always we are eager to increase the pool of singers and servers so please get in touch with me if you are interested. At the invitation of Bishop Moriarty and in response to Pope Benedict's Apostolic Letter Summorum Pontificum, priests from the Priestly Fraternity of St. Peter will celebrate a Latin Mass for the faithful of the Diocese attached to the older ("extraordinary") form of the Roman Rite (liturgical books of 1962). This Mass will be celebrated on the 2nd Sunday of every month in Cill Mhuire Church, Newbridge, Co. Kildare, beginning on Sunday, 12th October, at 1.00 p.m.
From St. Conleth's Parish Newsletter for Sunday, 5th October, 2008. We acknowledge the ongoing rumor regarding a possible appointment of Archbishop M. Ranjith, the current Secretary of the Congregation for Divine Worship and the Discipline of the Sacraments, to a major diocese in his native Sri Lanka. Nonetheless, we also notice that it is an ancient and recurring rumor - we first reported it last April ("Motu Proprio wars in the Roman Curia: Ranjith off to Sri Lanka?"). "He who heareth my word, and believeth ...hath life everlasting." (John, 5, 24) This affirmation by Jesus, which we heard in the Gospel, makes us think of the hardest moments of the pontificate of Pius XII, when, perceiving the collapse of every human certainty, he strongly felt the need, even through a constant ascetic effort, to adhere to Christ, the only certainty that never passes. The Word of God became thus a light in his path, a path on which Pope Pacelli consoled the downtrodden and the persecuted, on which he dad to wipe away the tears of pain and weep for the countless victims of the war. Only Christ is the true hope of man; only trusting in Him is the human heart able to open itself to the love which conquers hate. As Vicar of Him Who in a decisive hour pronounced before the highest earthly authority of that day, the great words: "For this was I born, and for this came I into the world; that I should give testimony to the truth. Every one that is of the truth, hearest My voice" (Saint John xviii. 37), We feel We owe no greater debt to Our office and to Our time than to testify to the truth with Apostolic firmness: "to give testimony to the truth." This duty necessarily entails the exposition and confutation of errors and human faults; for these must be made known before it is possible to tend and to heal them. "You shall know the truth and the truth shall make you free" (Saint John viii. 32). In the fulfillment of this, Our duty, we shall not let Ourselves be influenced by earthly considerations nor be held back by mistrust or opposition, by rebuffs or lack of appreciation of Our words, nor yet by fear of misconceptions and misinterpretations. We shall fulfill Our duty, animated ever with that paternal charity which, while it suffers from the evils which afflict Our children, at the same time points out to them the remedy; We shall strive to imitate the Divine Model of shepherds, Jesus, the Good Shepherd, Who is light as well as love: "Doing the truth in charity" (Ephesians iv. 15). 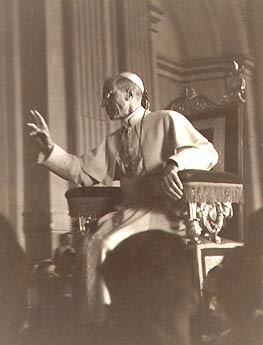 Pius XII kept his promise, doing the Truth in Charity. “But the testimony which I have is greater than that of John, for the works which the Father has granted me to accomplish, these very works which I am doing, bear me witness that the Father has sent me. . . . . You search the scriptures, because you think that in them you have eternal life, and it is they that bear witness to me; yet you refuse to come to me that you may have life. . . . . If you believed Moses, you would believe me, for he wrote of me.” Gospel of John, Chapter 5. “And he expounded the matter to them from morning till evening, testifying to the kingdom of God and trying to convince them about Jesus both from the law of Moses and from the prophets. And some were convinced by what he said, while others disbelieved. So, as they disagreed among themselves, they departed, after Paul had made one statement: ‘The Holy Spirit was right in saying to your fathers through Isaiah the prophet: “Go to this people, and say, You shall indeed hear but never understand, and you shall indeed see but never perceive. For this people’s heart has grown dull, and their ears are heavy of hearing, and their eyes have closed . . .”’ Acts of the Apostles, Chapter 28. 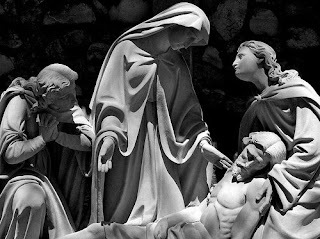 “It [the Passion] is a grave and sad page which evokes the clash between Jesus and the Jewish people. This people predestined for receiving the Messiah, which was awaiting him for thousands of years and was entirely absorbed by this hope and certitude; at the crucial moment, that is when Christ comes, speaks and manifests himself, not only does not recognize him, but combats him, slanders him and finally will kill him.” Pope Paul VI, Homily, Passion Sunday, April 4, 1965, in Osservatore Romano, April 7, 1965, and in Documentation catholique 1448, May 16, 1965, columns 887-888. “Let us pray for the unfaithful Jews, that our God and Lord will remove the veil from their hearts, that they themselves may acknowledge Jesus Christ, our Lord. Almighty and everlasting God, who does not reject even the unfaithfulness of the Jews from your mercy, hear our prayers which we bring on account of the blindness of that people, so that, having acknowledged the light of your truth which is Christ, they may be rescued from their darkness.” Translated from the Roman Missal for the liturgy of Good Friday as approved by Pope Pius XII and the immemorial custom of the Church. "As you know, the absolute innovation of this Synod [of Bishops] is the presence of a rabbi, who yesterday afternoon spoke in congregation: it is the Chief Rabbi of Haifa, Shear-Yashuv Cohen. The latter, in an intervention dedicated to the interpretation of Scripture according to the Jewish faith, attacked Iranian president Ahmadinejad. And, in the evening, interviewed by Phil Pullella, a Vaticanist for Reuters, said that the Church should not beatify Pius XII and that, had he known that Benedict XVI was about to celebrate the fiftieth anniversary of the death of Pope Pacelli (with the Mass he will celebrate tomorrow at Saint Peter's), he would not even have come to the Synod. 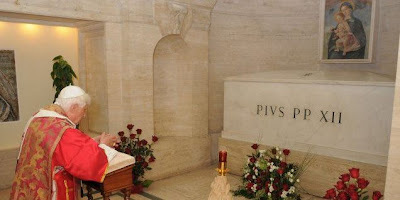 Apart from the fact that the date of the death of Pius XII is not exactly a Mossad secret, being found in every encyclopedia, apart from the fact that the fiftieth [anniversary] represents an important date, I find completely out of place that a Jewish exponent, invited to speak to the Catholic bishops, makes use of it to embarrass the Pope, most of all based on black legends." 2. The Institute of Christ the King Sovereign Priest (ICRSS) is no longer a mere diocesan institute, but has been recognized by Pope Benedict XVI as a Society of Apostolic Life of Pontifical Right. On the feast day of Our Lady, Queen of the Holy Rosary, the Vice-President of the Commission Ecclesia Dei, Very Reverend Monsignor Camille Perl, has read in our Seminary chapel the official decree by which, in the name of the Holy Father, the Institute of Christ the King Sovereign Priest was erected to the status of a Society of Apostolic Life of Pontifical Right. Also our Sisters Adorers of the Royal Heart of Jesus received the status of Pontifical Right. The Decree was signed by His Eminence Dario Cardinal Castrillon Hoyos. A Solemn Te Deum followed the reading of the Decree. Born out of a profound union with the Holy Father in Rome and the Institute's founder and members having always lived in a continuous and unwavering spirit of faithful Romanitas, the Institute was granted the Pontifical Right after the formal time of experience and interrogation which is a traditional custom for the Holy See. Various positive Apostolic Visitations conducted by the Roman Curia and a very favorable consultation of all the Most Reverend Bishops in whose Dioceses we are invited to serve have finalized this canonical process. After this affirmative evaluation of our spirituality and our international presence and work, the Pontifical Right is an expression of the appreciation of the service of the Institute of Christ the King by the Roman Pontiff and his collaborators to whom we are deeply obliged. The Pontifical Right will make it even easier for the Institute to conduct its service for the Church according to its constitutions and gives to Monsignor the Prior General rights and duties that are in unison with our canonical lifestyle. BENEDICTO XVI SUMMO PONTIFICI PAX, VITA ET SALUS PERPETUA! The word of God is the foundation of everything, it is true reality. And in order to be realists, we must count on this reality. We must change our ideas that the material, solid things, that which can be touched, is the more solid and more secure reality. At the end of the Sermon on the Mount, the Lord speaks to us of two possibilities for building the house of one's life: on the sand, or on the rock. Those who build on the sand to build upon the visible and tangible things, on success, on career, on money. Apparently, these are the true realities. But all of this will pass away one day. We see this today in the collapse of the major banks: this money is disappearing, it is nothing. And like all of these things, which seem to be the true reality on which to rely, our realities of a second order. Those who build their lives on these realities, on the material, on success, on all that which is visible, build on the sand. Only the word of God is the foundation of all reality, enduring like the sky, and even more than the sky, is reality. We must therefore change our concept of realism. The realist is the one who recognizes in the Word of God, in this apparently feeble reality, the foundation of everything. The realist is the one who builds his life on this foundation that remains forever. On Sunday morning, 5th October Pope Benedict celebrated the opening Mass for the XIIth General Ordinary Assembly of the Synod of Bishops. The Mass was offered in the Basilica of Saint Paul's Without-the-Walls. 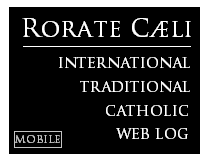 This post is a continuation of two previous posts on Rorate Caeli about the form of the 16th century chasuble. Please re-read these posts here and here. 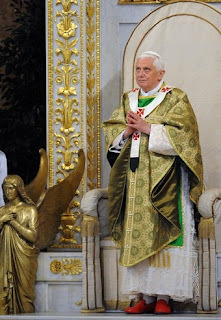 On the occasion of the Opening Mass, Pope Benedict wore a green chasuble almost identical in shape and dimensions with the famous statue of Saint Philip Neri by the sculptor Algardi. A digitally-enhanced photograph of that statue is adjacent. This green Papal chasuble conforms very closely with the dimensions set down by Saint Charles Borromeo at the end of the 16th century governing the size of the chasuble. Note that this chasuble differs significantly in its length and shape from another style of chasuble from the 16th century, which is sometimes referred to as the "Philip Neri" style. 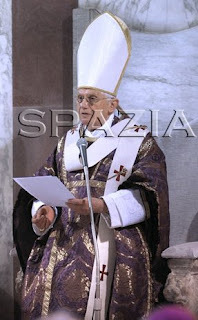 A purple and a red chasuble in this "Philip Neri" style were made for the use of Pope Benedict earlier this year (see adjacent photographs). 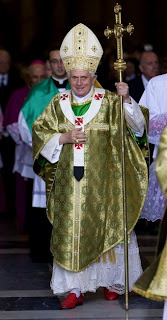 Photographs of the green chasuble at the beginning of this post from the Papa Ratzinger Forum: with thanks. Click on each of the images below for an enlarged view. As the Synod on Holy Scripture is opened by Pope Benedict XVI in the Basilica of Saint Paul Outside the Walls, a good article on the forms of the Roman Rite and the Scripture readings. Some say that the post-Conciliar Mass is richer in Readings and Eucharistic Prayers, while the Missal said of Pius V would be poorer and less accurate. The theory is anachronistic since it fails to consider four centuries of distance; it is as if we were to say the same about "Sacramentaries" some centuries earlier than that of Pius V. What is more, it is forgotten that the pericopes of the Pius V Missal were formed on the basis of old capitularies with epistles, such as St Jerome's Liber comitis– dated 471 - or with Gospel pericopes ; a tradition in common with the Church of the East, as the Byzantine liturgy still shows today. Secondly, the brief readings help memorize the essential and express the sobriety of the Roman Rite. 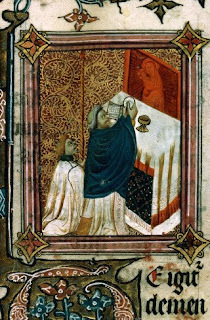 Some even go as far as to say that the Extraordinary Form of the only Latin Rite gives too little emphasis to the presence of Christ in the Word, when the latter is proclaimed in the assembly; in this cas,e the liturgy loses its very essence, the 'two tables' - in Dei Verbum, n. 21, there would appear to be only “one” - forming one act of worship! It is said that the Missal of the Council of Trent moves in a vision far from the tradition of the Church Fathers; that the Missal was planned for the priest only, not for the participation of the assembly because the congregation is merely irrelevant. 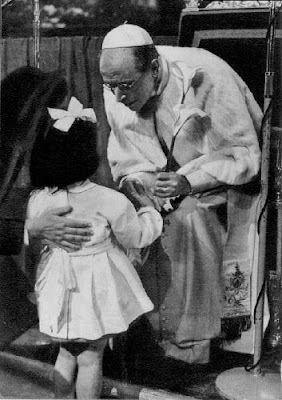 In fact, it is said that the priest celebrates on his own and so does the congregation; they say the Mass of Paul VI is quite different because it is not the priest who celebrates but the Church, sacramentally present in the assembly, of which the priest, by reason of order, is the natural president. This position is considerably problematic because it reduces everything to Word and Assembly. However “Jesus is not just the teacher, but also the redeemer of the whole person. The Jesus who teaches is, at the same time, the One who saves ” (J.Ratzinger-Benedict XVI, Gesù di Nazaret, p. 65) and this comes about effectively only through the Eucharistic Sacrament. Another theory, widespread due to the customary phenomenon of substitution and exchanging one thing with another, is to equal the presence of Jesus Christ in the Blessed Sacrament with the presence of the Word in the Book of the Scriptures: the latter presence takes place only “when the Holy Scriptures are read in the Church” (Sacrosanctum Concilium n. 7). It is necessary to reaffirm that Christ's presence in the Word exists on two conditions: when it is read out “in the Church assembly ”, not privately, and when Sacred Scripture is 'read'. Therefore the holy book placed on the lectern or the altar is not sufficient for this presence. To conclude, it is more than ever urgent for preaching and catechesis to return to making the proper distinction between Revelation, Word of God and Sacred Scripture which, although closely connected, are not equivalent. At times in fact, not without surprise, we see in this regard considerable confusion and not only among the lay faithful. Some even think that the Bible is to be interpreted with the Bible and not, as the Catholic Church has always held, with Tradition and by faithful listening to the Magisterium. FIDES translation, adapted according to the Italian original. Note: Back from recess, we acknowledge the e-mail messages referring us to the new website of the Pontifical Commission "Ecclesia Dei", first acknowledged by the Spanish Traditional Catholic blog "Hoc Signo". Unfortunately, the website is still very much incomplete, but it may hopefully be a work in progress. Recess continues for three days. Saint Bernard says there are three ways by which we ought to honor our guardian angels: "by reverence, by devotion, and by confidence." By reverence, because these holy spirits and princes of heaven are always present with us, and assist us in all our actions. And on this account, out of regard to our guardian angels, we ought carefully to refrain from every action which can displease them. Saint Frances of Rome, widow, saw that the angel who attended her in a human form, every time that he observed any improper action or word in any one in conversation, covered his face with his hands. [Prayer:] O my holy guardian angel, how many times have I by my sins obliged you to cover your face! I ask your forgiveness, and I beseech you to implore forgiveness for me from God, for I am resolved to offend neither God nor you any more by my negligences. In the second place, we ought to honor our good angels by devotion to them, on account of the respect which they deserve, and the love which they have for us. No love of father, brother or friend, can equal the love which our good angels have for each one of us. Our worldly friends often love us from motives of interest, and on this account very easily forget us when we are in adversity, and much more when we offend them. 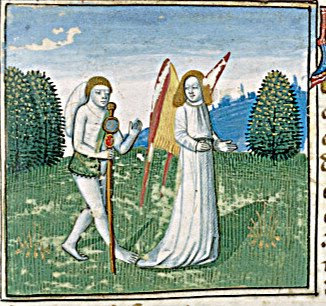 Our angel guardians love us solely from motives of charity, and hence when we are in difficulties they assist us more particularly, and cease not to help us after we have rebelled against God. Then will they endeavor to enlighten us, in order that we may soon return to God by repentance. [Prayer:] O, how much do I thank you, my holy guardian, for the lights which you have communicated to me. Oh that I had always obeyed you! Continue to enlighten me, rebuke me when I fail, and do not forsake me unto the last moment of my life. In the third place, we ought to have great confidence in the assistance of our good angels. God's love for us was not satisfied with giving us his Son Jesus for our Redeemer, and Mary for our Advocate; he has been pleased to give us also his angels to be our guardians, and has commanded them to assist us during the course of our lives: "He hath given his angels charge over thee: to keep thee in all thy ways" [Psalm xc, 11]. [Prayer:] O God of infinite mercy, what more canst thou do for me that I may be saved? I thank thee, O my Lord; and I thank you also, O prince of paradise, my good angel, who for so many years have assisted and protected me. I have been unmindful of you, but you have not forgotten me. Who knows how much farther I may have to go before I enter eternity? O my good angel, guide me in the way to heaven, and cease not to assist me, until you behold me become your eternal companion in the kingdom of heaven! Congratulations to the Church Music Association of America for another mighty addition to its list of online liturgical works: the Graduale Romanum (1908), one of the greatest liturgical accomplishments of the pontificate of Saint Pius X. Tip: The New Liturgical Movement.